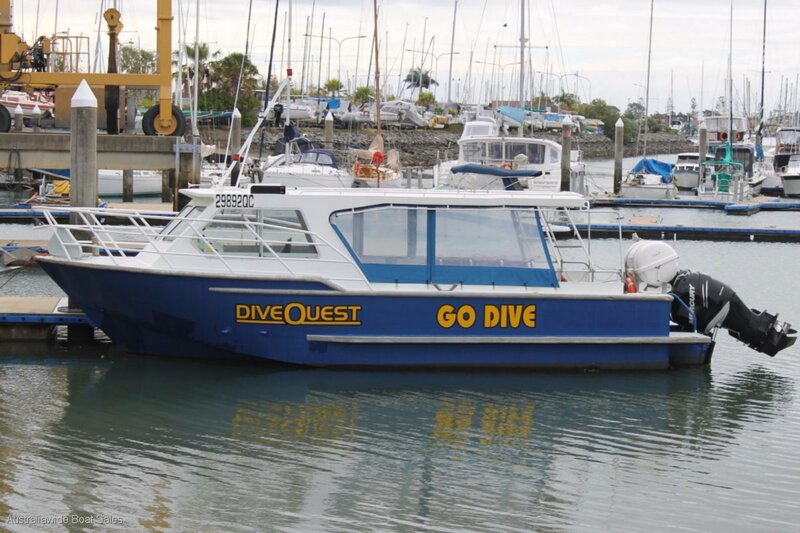 Built to survey by Hampton Boat Builders in WA and is currently operating as a professional dive boat in current 1D, 2C & 2D Qld survey. In December 2016 she had installed new twin 300hp Mercury Verado outboards. There's seating and tank storage for 20 people, a deck shower and an electric marine toilet with holding tank in the fore peak along with additional general storage compartments. She comes with all the required safety gear and certifications for continued commercial use in Qld. For interstate purchasers please contact your own local authority to ascertain compliance in your state or territory. Designed by the late, highly respected, award winning naval architect Dave Jackman, she offers a solid and supremely comfortable ride in most offshore conditions. The vessel is currently working out of Manly Harbour and as such, inspections must be arranged in advance by contacting Australiawide Boat Sales on 07 3348 3177. We can also be of assistance for interstate or international delivery. Vendor very motivated to sell and will consider offers. Twin 300hp Mercury Verado outboards - Installed new December 2016. Top Speed 40 knots, cruising speed 23 knots. Stainless steel sink, cold water tap. Seating and dive tank storage for 20 people. Electric marine toilet with holding tank. Full side covers and clears. SARCA anchor on chain to a Maxwell two way electric capstan. Fully compliant for QLD 1D, 2C & 2D survey. OceanMaster "Great Circle" life raft - last serviced June 2016. Garmin GPS plotter, Smart Craft "Vessel View" outboard systems display, Lowrance Elite-5 Chirp fishfinder, Suunto dash mounted compass. Port and starboard transom gates, starboard boarding gate, alloy swim ladder, horn, windshield wiper, alloy bow rail and grab rails, fenders and mooring lines.